It's always a lot of fun to meet up with cruisers but it's especially fun when there are kids aboard. When we were in the Tobago Cays we met several cruising families (Orchid and Alfard). Everyone had a great time snorkelling and visiting and playing games. We all went our separate ways at Christmas. 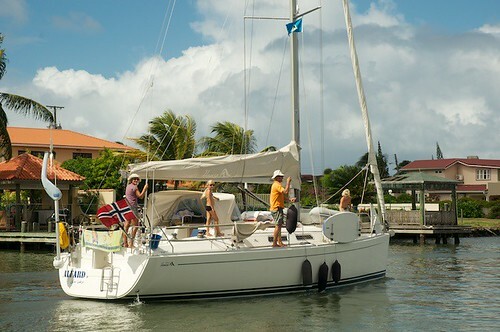 Now in St. Lucia we've met new families (Kamaloha) and re-united with some that we met in the Cays (Alfard). It's been great reconnecting and the kids have all had a blast playing in the dock-side pool. A couple of the boys (Aidan and Brendan) are going dinghy sailing in opties later this afternoon and there was a huge Lego Star Wars battle in our saloon this morning. Unfortunately Alfard needs to be back in the Cays to visit with some friends so they pulled out today. We hope that we'll meet up with them again up island some place.